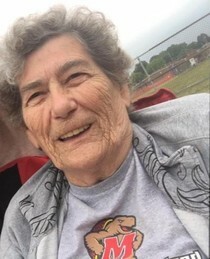 Betty J. Whyel age 87 of Ashland, passed away on Saturday March 23, 2019 at the Grant Medical Center. Born on September 13, 1931 in Deal Island, Maryland, the daughter of Willis and Katherine (Stein) Horner she had been an Ashland resident since 1963. Mrs. Whyel was a retired employee of Ashland Rubber Products and she was also a homemaker. On August 5, 1950 Betty married Eugene Whyel who preceded her in death in 1983. She is survived by three daughters and four sons; Marie (Flacco) Cardenas of St. Albans, West Virginia, Cathy Combs of Willard, Darla Whyel of Ashland, Robert (Deandrea) Whyel of Ashland, Micheal (Crystal Reed) Whyel of Ashland, George Edward (Mindy Watson) Whyel of Ashland and Willis Christopher (Delta) Whyel of Mansfield. Mrs. Whyel is also survived by twenty five grandchildren, thirty five great grandchildren and seven great great grandchildren. Two sisters, June Robinson of Baltimore, Maryland and Darnell Horner of Texas also survive. She is also survived by her best friend Lena Ison and her puppy Holly. In addition to her husband Eugene, Betty is preceded in death by her parents, son Ronald Eugene, three brothers and two sisters. Mrs. Whyel enjoyed playing Bingo at the Kroc Center. She was a member of the sewing circle at the Ashland Brethren in Christ Church where she was a member and she loved visiting Wal-Mart.